In the twelfth issue of the Bed and Breakfast Traveller, we visit Ottawa, Ontario. Whether you're seeking a dose of culture, a romantic holiday, family vacation, or adventure in the great outdoors, you'll find it (and more) in the National Capital Region! 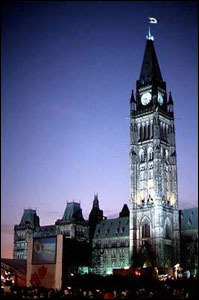 Those with an interest in history of all varieties will enjoy visiting Ottawa's 12 national museums. Explore past and present in the fields of art, science and technology, war, aviation, civilization, and nature. The By Ward Market, the Glebe, and the assortment of shopping centers offer multiple shopping opportunities, and every section of the city and its outskirts has fine dining establishments catering to every taste. If you're an outdoors enthusiast, there is something to do in Ottawa no matter what the season or weather. Take a cruise along the Canal, go biking or rollerblading along one of the region's three waterways, skate on the frozen river on your way to Winterlude. Take a day trip to Gatineau Park or one of the other parks in the vicinity, and indulge in downhill or cross-country skiing, camping, hiking, swimming, and boating. Be sure to visit the Parliament Buildings.... just to say you did. Features 60 rides, a free concert series, and a variety of free interactive exhibits and entertainment. Small admission fee charged. Website: www.the-ex.com. 7th annual festival celebrating the country's lively folk tradition. Over 150 performers on 6 stages Saturday and Sunday afternoons. Special shows for children. Website: www.ottawafolk.org. Features 150 hot air balloons from 8 countries, 200 shows and activities, and a fireworks show. For more information, call 1-800-668-8383. Come celebrate autumn's harvest of color. The event features workshops, guided tours, and special activities for children, all amidst fall splendor in Gatineau Park. Website: http://www.capcan.ca.